Carpool on BlaBlaCar to support #OddEvenFormula! The Delhi government has proposed a restriction on usage of cars on Delhi roads on the basis of odd and even registration numbers. This system is aimed at curbing alarming levels of air pollution and is scheduled to be implemented in Delhi from April 15, 2016. How can BlaBlaCar help you with #OddEvenFormula? BlaBlaCar can help you connect with car owners who have cars with odd or even number plates respectively so you can travel everyday without any worries. If you’re a co-traveller looking for a ride for eg: you have an even car and you want to travel on odd dates, you can go on BlaBlaCar to find your ride for the respective dates and choose to travel with a car owner who is going your way! How can BlaBlaCar help #office-goers? If you’re working in an organization where you would like your colleagues to benefit from car pooling during #ODDEVENFORMULA as much as you do then you can contact us. We can come and present the solutions which will make car pooling easier within your organization. Simply write to us if you’re interested! 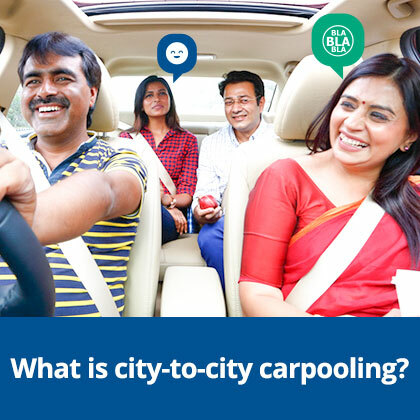 October 3, 2016 What is city-to-city carpooling?